The 23-storey Pender Gardens high-rise is nearly completed, after nearly 10 years of continuous construction activity. The application for the 31-storey Mercury House was approved last month and next Thursday, the Planning Authority Board will consider planning application PA2478/16 submitted by Garnet Investments Limited in respect of a substantial stretch of land along St George’s Bay on the outskirts of Paceville St Julian’s. The project includes mixed-uses covering a total site area of 48,723 square metres, a building footprint of 18,345 square metres and a total gross floor area of 82,917 square meters. It is a small part of the area that was tentatively tackled by a draft Masterplan for Paceville which, after being rejected by public opinion was sent back to the drawing board. I consider it highly unethical for the Planning Authority to proceed with considering this application after the clear and resounding verdict of public opinion. As a minimum, the consideration of this application should have been postponed until a new, reasonable and acceptable Masterplan has received the go-ahead. A minimum effort at achieving consensus as to what development is acceptable is essential. The Planning Authority is unfortunately insensitive to public opinion. It is amply clear that it, and those who appoint most of its Board members, are on the same wavelength as the development lobby, which is hell-bent on making hay while the sun shines. At this point in time, it is the turn of the St George’s Bay area. The project is obviously recommended for approval in the 43-page report from the Planning Directorate. The basic point of contention with such large-scale projects is that they are considered in isolation. Most of them would never get off the drawing board (real or virtual) if the consolidated impact of all neighbouring projects (existing or in the pipeline) are taken into account. Earlier this week, I had the opportunity to address similar concerns to the EIA public consultation on the db Group ITS site project. Five large-scale projects are earmarked for St George’s Bay. Each will generate considerable havoc from excavation throughout construction and right through operation in the whole St George’s Bay area. Cumulatively it will be hell. Who cares? Way back in 2006, when the Strategic Environmental Assessment Directive of the EU was about to be implemented in Malta, the Lawrence Gonzi – George Pullicino tandem rushed through the approval of the Local Plans in such a manner as to ensure that the accumulated environmental impact resulting from their implementation was not scrutinised and acted upon. The present state of affairs is the direct result of that irresponsible Gonzi-Pullicino action 12 years ago. The Environment and Resources Authority (ERA) occasionally tries to patch things up. For example, within the framework of the ITS EIA exercise ERA suggested that the traffic assessment of the ITS and the Villa Rosa projects be consolidated. This has, however, been avoided: a case of too little, too late. The development lobby is maximising its efforts to make hay while the sun shines. In reality, a consolidated mess is taking shape with massively built-up areas in a relatively restricted space punctured by high rises mimicking phallic symbols of all shapes and sizes spread all over the place. Pender Place has 23 floors. Mercury House will have 31. The ITS phallus will have a 37-floor residential tower. The Villa Rosa/Cresta Quay project will have more modest heights. Next Thursday, the Planning Authority has the opportunity to scrutinise the proposal for this Villa Rosa-Cresta Quay project. We will see once more the extent to which the concrete lobby still holds the Authority by its balls – obviously where this is applicable. Matul dawn l-aħħar ġranet, Alternattiva Demokratika kienet qed tikkampanja kontra żvilupp massiċċ li ġie propost kemm fil-Mosta kif ukoll f’Marsaxlokk. Din hi kampanja li ilha li bdiet ħdax-il sena, u tibqa’ għaddejja, kontra t-tkabbir taż-żona żviluppabbli proposta minn George Pullicino, dakinnhar Ministru responsabbli għall-ambjent u l-ippjanar għall-użu tal-art. Nhar il-Ġimgħa, f’Marsaxlokk, kien ta’ sodisfazzjoni li s-Sindku Horace Gauci, elett f’isem il-Partit Laburista, ingħaqad magħna ta’ Alternattiva Demokratika waqt konferenza stampa b’appoġġ għar-residenti Tal-Marnisi Marsaxlokk. Hi kampanja biex is-sens komun favur l-ambjent jipprevali fuq id-deċiżjoni li kien ħa l-Parlament fl-2006 meta l-Gvern immexxi mill-PN mexxa ‘l-quddiem proposta biex żewġ miljun metru kwadru ta’ art li kienu barra miż-żona ta’ żvilupp, ma jibqgħux iktar ODZ u minn dakinnhar jibdew jiffurmaw parti miż-żona ta’ żvilupp. Dan sar mingħajr ma ġew eżaminati l-impatti ta’ deċiżjoni bħal din, lejliet li kellha tidħol fis-seħħ id-Direttiva tal-Unjoni Ewropeja dwar il-kejl tal-impatti strateġiċi ambjentali. Li ma sarx dan l-kejl, ifisser li l-impatti kumulattivi tal-iżvilupp li kien qed ikun propost kienu kompletament injorati. Nhar it-Tnejn 20 ta’ Marzu l-Kumitat Eżekuttiv tal-Awtoritá tal-Ippjanar ħa żewġ deċiżjonijiet kontrastanti dwar żewġ meded kbar ta’ art. Dwar l-ewwel waħda, art agrikola fil-Mosta tal-qies ta’ 38500 metru kwadru l-proposta bi pjan ta’ żvilupp kienet rifjutata filwaqt li dwar it-tieni waħda ukoll primarjament agrikola u b’qies ta’ 17,530 metru kwadru, l-propost pjan ta’ żvilupp kien approvat. Fiż-żewġ każi ma sar l-ebda eżami tal-impatti soċjali, ekonomiċi u ambjentali u dan billi l-professjonisti tal-ippjanar li taw il-parir lill-Kumitat Eżekuttiv tal-Awtoritá tal-Ippjanar kienu tal-fehma li d-deċiżjoni tal-2006 tal-Parlament kienet kemm ċara kif ukoll finali. Sfortunatament ma dehrilhomx meħtieġ li jeżaminhaw dan minn lenti kritika. Fl-2006, il-Parlament kien iddeċieda li dawn iż-żewġ miljun metru kwadru ta’ art ma kellhomx iktar ikunu meqjusa bħala barra miż-żona tal-iżvilupp (ODZ). Il-grupp parlamentari tal-PN kien ivvota favur din il-proposta, u dan jispjega l-għaliex dak li taparsi kkonverta favur l-ambjent, Simon Busuttil, għadu ma fetaħx ħalqu dwar dan kollu. Imma l-Partit Laburista, dakinnhar fl-Opposizzjoni ma kienx qabel u kien ivvota kontra li din l-art tkun tista’ tingħata għall-iżvilupp. Għalhekk Joseph Muscat bħalissa qiegħed f’posizzjoni imbarazzanti. Il-Partit Laburista għadu tal-istess fehma, jew bidel il-ħsieb? Għax issa waslet is-siegħa tal-prova. X’ser jagħmel? 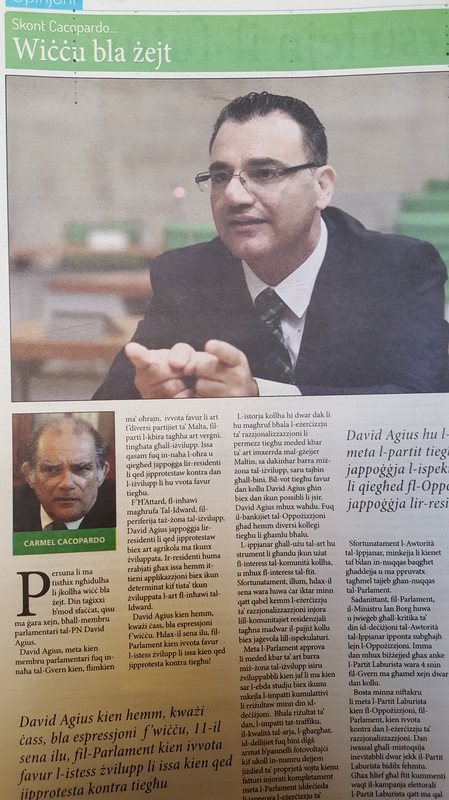 Għax anke jekk ikun meqjus li d-deċiżjoni tal-Parlament tal-2006 titfa’ ċerti obbligi fuq il-Gvern u fuq l-Awtoritá tal-Ippjanar, xorta hu possibli li l-impatt tal-iżvilupp massiv li ġie propost ikun imtaffi. Id-deċiżjoni tal-20 ta’ Marzu tal-Kumitat Eżekuttiv tal- Awtoritá tal-Ippjanar li biha l-applikazzjoni dwar l-art fil-Mosta kienet rifjutat hu l-mod kif għandhom isiru l-affarijiet. Hi deċiżjoni li s-Segretarju Parlamentari Deborah Schembri għandha żżomm quddiem għajnejha meta l-każ ta’ Marsaxlokk jiġi quddiema biex tikkunsidra jekk tagħtix l-approvazzjoni tagħha. Jiena naħseb li s-Segretarju Parlamentari Schembri għandha tibgħat il-każ ta’ Marsaxlokk lura quddiem l- Awtoritá tal-Ippjanar biex ikun ikkunsidrat mill-ġdid. Żvilupp massiv ta’ din ix-xorta m’għandux ikun possibli meta hawn tant propjetajiet residenzjali vojta. Anke f’Marsaxlokk stess l-aħħar ċensiment, dak tal-2011, juri li 18.7% tar-residenzi huma battala filwaqt li 5.9% tagħhom jintużaw biss kultant. Nistgħu nibqgħu nibnu bil-goff meta għandna din il-kwantitá ta’ propjetá vojta? Għandna bżonn ftit sens komun fl-ippjanar ta’ l-użu ta’ l-art. Sens komun li jagħti piz u konsiderazzjoni tal-impatti fuq il-komunitá kollha qabel ma jittieħdu deċiżjoniiet bħal dawn. Fiż-żewġ każi, l-Mosta u Marsaxlokk, qed nitkellmu dwar raba’ li kienet tinħadem u li issa intelqet minħabba l-pressjoni kkawżata mill-iżvilupp. Dan hu process li jeħtieġ li nwaqqfuh minnufih. Illum qabel għada. 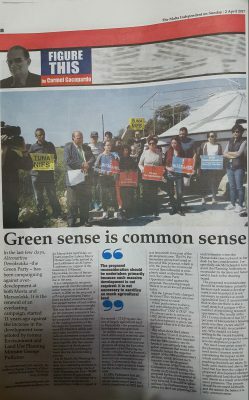 In the last few days Alternattiva Demokratika-the Green Party- has been campaigning against over-development at both Mosta and Marsaxlokk. It is the renewal of an everlasting campaign, started 11 years ago against the increase in the development zone piloted by former Environment and Land Use Planning Minister George Pullicino. In Marsaxlokk last Friday we were joined by Labour Mayor Horace Gauci who arrived at, and addressed an AD press conference in support of the residents of Il-Marnisi, Marsaxlokk, in view of the impact of the rationalisation exercise in the area. It is a campaign to see green sense prevail over the rationalisation exercise, as a result of which, in 2006 on the proposal of a PN-led government, Parliament included around two million square metres of land within the development zone overnight. This was done without a strategic environment assessment having been carried out to examine the proposals. It was on the eve of the coming into force of the Strategic Environment Assessment EU Directive which, just days later, would have made such an assessment compulsory. Not carrying out such an assessment signifies that the cumulative impacts of development were ignored by not being factored into the decision-taking process. On 20 March, the Planning Authority Executive Committee took two contrasting decisions in respect of two large tracts of land. 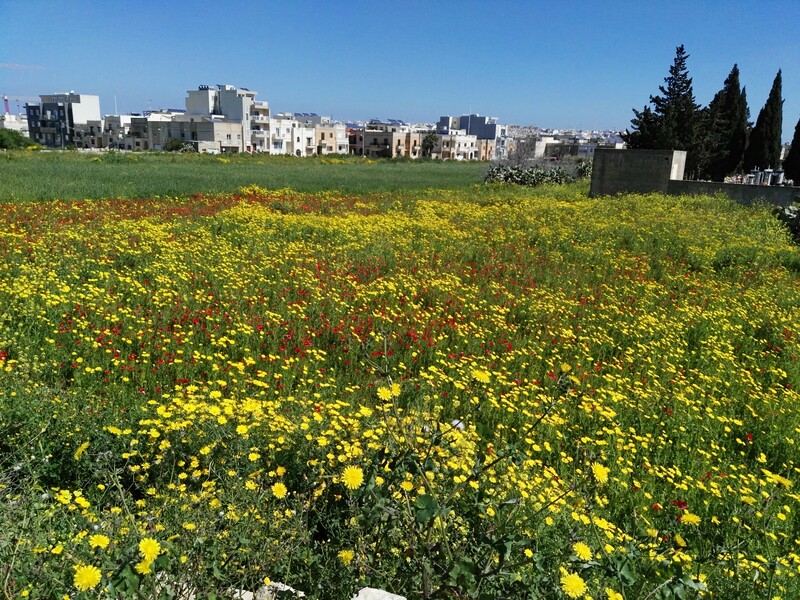 Regarding the first – 38,500 square metres of agricultural land at Mosta – the scheme for a development proposal was turned down, while in respect of the second – 17,530 square metres of largely agricultural land in Marsaxlokk – the proposal for development was approved. In neither case was any assessment of the social, economic and environmental impact carried out, as the professional land-use planners advising the Executive Committee of the Planning Authority consider that Parliament’s decision in 2006 was definite and any assessment unnecessary. Unfortunately they did not think it appropriate to examine the matters before them critically. In 2006, Parliament had decided that this two million square metre area of land, formerly considered as ODZ land, was henceforth to be part of the development zone. The PN Parliamentary group had voted in favour of this proposal, which is why the pseudo-environmental convert Simon Busuttil is completely silent on the issue. However, the Labour Party Opposition voted against the proposal, thus placing Joseph Muscat in an awkward position today. Has the Labour Party changed its views? The chickens are now coming home to roost. When push comes to shove, and notwithstanding the PN mantra that “ODZ is ODZ”, the PN always seeks to consent to ODZ development, as long as such development is given the go-ahead when it is in the driving seat! But what about the Labour Party today? Even if it factors in the views of those who maintain that the 2006 decision ties its hands, it can certainly take mitigation measures that would substantially reduce the negative impact of the 2006 parliamentary decision which favours such massive over-development. The decision of the Executive Committee of the Planning Authority on the 20 March to reject the proposal for the development of the tract of land in Mosta is the way forward. 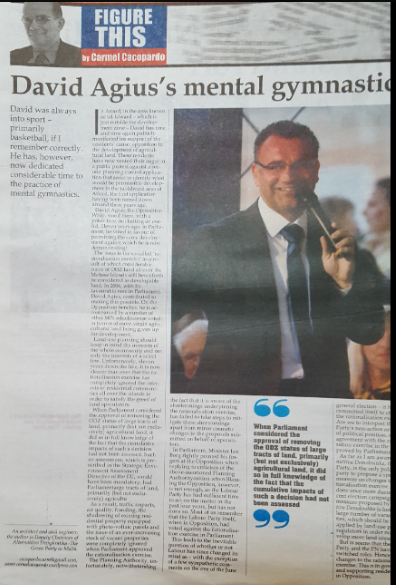 It should be taken on board by Parliamentary Secretary for land use planning Deborah Schembri when the Marsaxlokk case is placed on her desk for her consideration. I respectfully ask Ms Schembri to request the Planning Authority to reconsider its decision and hence send it back to the drawing board. The proposed reconsideration should be undertaken primarily because such massive development is not required: it is not necessary to sacrifice so much agricultural land. (I am informed that on the site there is also a small stretch of garigue with a number of interesting botanical specimens.) The results of the 2011 Census indicated that 18.7 per cent of Marsaxlokk’s housing stock was then vacant and 5.9 per cent of it only in occasional use. Why should we keep adding to the vacant housing stock through proposals for massive development projects? We need some green sense in the planning of land-use. We need some common sense in considering the impact on the whole community before far-reaching decisions are taken. In both cases mentioned above, the land that has been the subject of proposed development schemes is agricultural land that has fallen into disuse as a result of development pressures. This process should be reversed forthwith, and the sooner the better: it is only common sense. Imma din il-ħotba fil-blat ftit għadha tidher bil-bini sfrenat li tela’ tul is-snin. Issa fl-aħħar forsi ser nieqfu biex naħsbu ftit dwar x’inhu jiġri. Id-deċiżjoni tal-bieraħ tal-Awtorità tal-Ippjanar li tirrifjuta l-applikazzjoni biex art fil-periferija tal-Mosta tkun żviluppata b’mod intensiv toffri tama li s-sens komun fl-ippjanar għall-użu tal-art f’pajjiżna għadu ma intilifx għal kollox. L-applikazzjoni PC 039/09 kienet biex ikun determinat x’tip ta’ żvilupp hu permissibbli fuq art tal-qies ta’ 38,600 metru kwadru ħdejn it-Torri Cumbo l-Mosta. Il-bierah jiena kont preżenti għas-seduta tal- Awtoritá u f’isem residenti fl-inħawi tkellimt kontra din l-applikazzjoni. Fissirt kif l-iżvilupp propost hu wieħed massiv u li kien neċessarju li jkun magħruf, permezz ta’ studji apposta, x’inhu l-impatt, mhux biss ta’ dan l-iżvilupp iżda ukoll fuq l-impatt kumulattiv. Jiġifieri meta tqis kemm l-impatt tal-bini eżistenti u żżid miegħu l-impatt tal-bini ġdid propost. Jiena konxju li l-istorja mhux ser tieqaf hawn. Id-deċiżjoni żbaljata favur l-iżvilupp ilha li ttieħdet sa mill-2006 meta l-Parlament iddeċieda li madwar żewġ miljun metru kwadru ta’ art fil-periferija tal-ibliet u l-irħula tagħna jingħataw għall-iżvilupp. Dakinnhar kienu qalu li dan kien eżerċizzju ta’ razzjonalizzazzjoni. Imma jiddispjaċini ngħid li hu kollox barra razzjonali! Huwa neċessarju li qabel ma din l-applikazzjoni tkun ikkunsidrata mill-ġdid, kif inevitabilment ser jiġri, ikun ikkunsidrat bir-reqqa l-impatt soċjali, ekonomiku u ambjentali ta’ dan l-iżvilupp massiċċ. Hemm ħtieġa li jsiru l-istudji neċessarji li jikkwantifikaw dan l-impatt kif ukoll li jkunu identifikati miżuri ta’ mitigazzjoni. Fost oħrajn għandna niftakru li l-aħħar ċensiment li sar fl-2011 kien żvela li minn 8359 residenza fil-Mosta, 16.2% kienu vakanti u 3.2% oħra kienu użati okkazjonalment. Dan waħdu diġa huwa raġuni valida biżżejjed li minħabba fiha dan it-tip ta’ żvilupp għandu jkun skoraġġit. Għandu jkun ikkunsidrat ukoll li għall-futur, il-kunsiderazzjoni ta’ applikazzjonijiet ta’ din ix-xorta għandhom ikunu akkumpanjati minn miżuri innovattivi ta’ ħarsien ambjentali fosthom l-obbligu tal-ġenerazzjoni ta’ elettriku mix-xemx b’tali mod li kull waħda mill-units reżidenzjali permessi tkun carbon neutral. Din id-deċiżjoni tal-Awtorità tal-Ippjanar, hi lezzjoni għall-Gvern u l-Oppożizzjoni: wasal iż–żmien li d-deċiżjoni stupida li kien ħa l-Parlament fl-2006 tkun reveduta. Mhux biss dwar l-art fil-Mosta iżda dwar kull wieħed miż–żewġ miljuni metru kwadru li dakinnhar ingħataw għall-iżvilupp. Alternattiva Demokratika hi kburija li tul dawn l-aħħar ħdax-il sena ma waqfitx titkellem fuq din il-materja u tistieden lill-Gvern u l-Oppożizzjoni biex jiftħu għajnejhom u jingħaqdu magħha biex din id-deċiżjoni ħażina tal-Parliament fl-2006 tkun indirizzata. There is a common thread running through a number of local land-use planning controversies: they are tending to either ignore or give secondary importance to environmental, social and/or cultural issues, focusing instead on economic considerations. 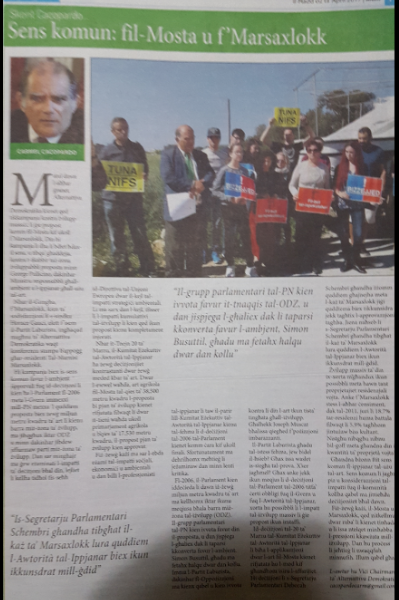 On this page I have discussed the impact of the Freeport Terminal on Birżebbuġa a number of times. The basic problem with the Freeport is that its impact on the Birżebbuġa community were ignored for a very long time. In fact, an attempt to include a Social Impact Assessment as an integral part of the EIA which was carried out some years ago was given the cold shoulder by MEPA. The end result was that the decision-taking process was not adequately informed of the impact of the terminal extension, both those already apparent and those which were yet to come. In particular, no assessment was made of the disintegration of the sports infrastructure in the area that has slowly been eaten up – primarily by the Freeport. Most of this could have been avoided through an active engagement with the local community over the years at the various stages of the project’s planning and implementation. This is why plans for the Freeport’s expansion, as indicated by the Freeport Corporation’s CEO earlier this week in an interview with The Business Observer, should be explained immediately. Even at this early stage it must be ascertained that the situation for Birżebbuġa residents will not deteriorate any further. No one in his right mind would deny that, over the years, the Freeport has made a significant contribution to Malta’s economic growth. Few, however, realise that the price paid for this economic success has been the erosion of the quality of life of the Birżebbuġa community. 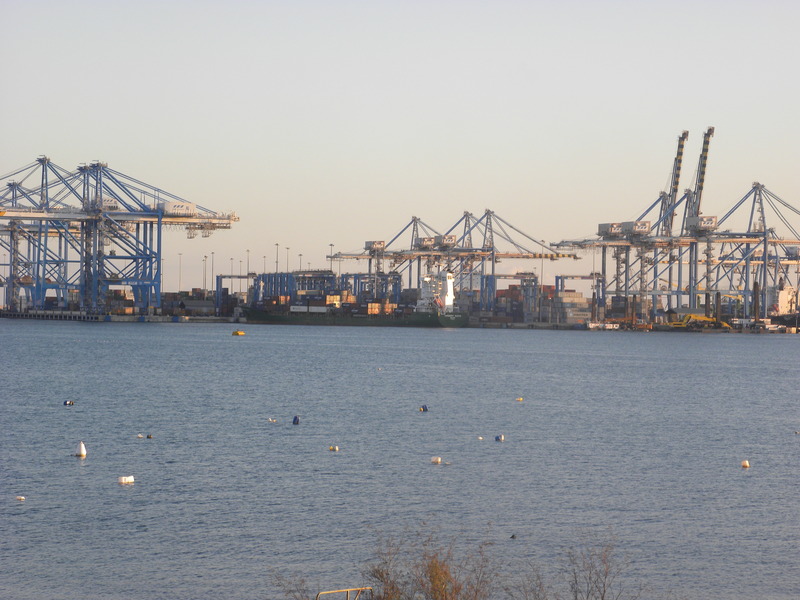 This is certainly unacceptable but it will only get worse, once the gas storage tanker for the Delimara Power Station is parked within Marsaxlokk Bay in the coming months, very close to the Freeport terminal. The same story is repeating itself in other areas. 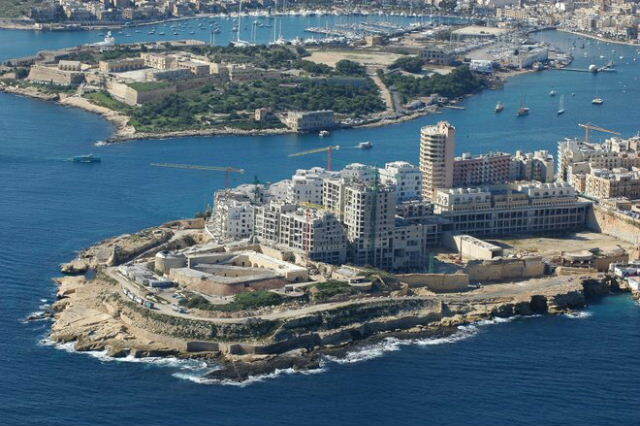 Consider, for example, the 38-floor tower proposed at Townsquare and the 40-floor tower proposed for the Fort Cambridge project, both on the Tignè Peninsula in Sliema. The Townsquare assessment process is reaching its conclusion, whilst the one in respect of Fort Cambridge is still in its initial stages. Yet both are linked to the same fundamental flaw: the lack of consideration of the cumulative impact of the development of the Tignè Peninsula – which includes the MIDI development as well as the individual small scale projects in the area. The adoption of plans and policies which have made it possible for the authorities to consider the development of the Tignè Peninsula were not subject to a Strategic Impact Assessment and, as a result, the cumulative impact of implementing these plans and policies were not identified and assessed. The end result is that the proposed towers are justifiably considered as another disruptive and unwelcome intrusion by the Tignè and Qui-Si-Sana communities. The developers and their advisors focus exclusively on the impacts which are generated by their proposals, with the authorities generally avoiding the consideration of the big picture at the earliest possible stage. Preliminary indications from the proposed Gozo Tunnel and the Sadeen “educational” setup at Marsaskala/Cottonera are already pointing in the same direction. In both cases, the alternatives that were generally brushed aside are the very options that need to be examined in detail in order to ensure that the challenges that will be faced in 2016 and beyond have not been prejudiced by myopic considerations in 2015. Planning failures have serious consequences on those of our local communities that have to bear the brunt of the decisions taken for a long period of time. These can be avoided if the authorities refocus their efforts and realise that the economy is a tool which has to be a servant, and certainly not a master.